Lens Description: The AT-X 100 PRO D is a new macro lens capable of life-sized (1:1) reproduction at 11.8 in. (30 cm). The lens\' multi-coating have been re-engineered to match the highly reflective silicon based CCD and CMOS sensors in today\'s digital SLR cameras. This lens gives the best of both worlds because optics still give full coverage and excellent sharpness on 35mm film. A macro lens that can handle both the digital and film worlds with ease. The AT-X 100 PRO D also has a very convenient focus limiter switch that can lock the focus out of the closes focus making it focus faster when used as a moderate telephoto lens that is excellent portraits as well. Other features of the AT-X 100 PRO D are: Tokina One Touch Focus Clutch Mechanism for fast easy switching between manual and Auto focus. 55mm non-rotating filter thread for use with macro ring flashes and special effects filters. The AT-X 100 PRO D also comes with a deep bayonet mounted lens hood. 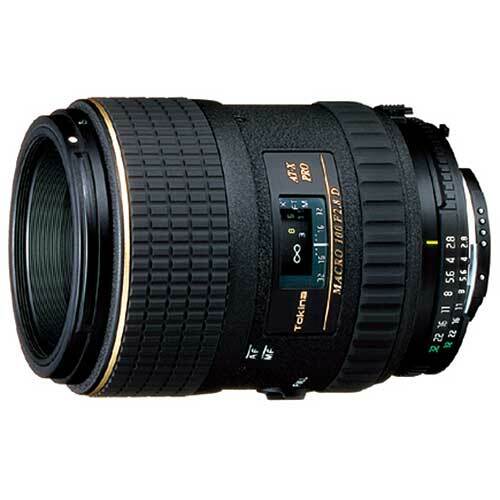 I Just ordered this lens after it has gotten great reviews from many photog sites…. plus less expensive compared to Nikon. But when I do, its usually Tokina. I originally purchased a Nikon 105mm f2.8 Vr macro. It is a very high quality lens but after using it for a few weeks I found one issue that was hard to deal with. I use a Nikon D7000 and with the Nikon mounted on this camera on my tripod it was very front heavy and unbalanced. Try as I might it just was a problem for me. I had the opportunity to use a Tokina 100mm f2.8 macro Pro and it felt so much better. It doesn’t have VR but I wasn’t using VR when tripod shooting and even on handheld macro shooting VR doesn’t work well. The Tokina is a very well constructed lens and feels tough and like it will just last. It balances on my camera and tripod so much better than the Nikon 105mm. If the Nikon had a tripod collar that would have helped a lot but it doesn’t. I returned the Nikon and bought the Tokina 100mm f2.8 macro and it produces photos of equal quality to the Nikon in my opinion. The Tokina is a very sharp lens even at f2.8 and is tack sharp by f8. The look and quality will remind you of Nikon Professional quality lenses but then Tokina was started by Nikon Engineers. I am very satisfied with this lens and have no regrets in my choice of Macro lens. I have to say the Nikon 105mm f2.8 macro VR is a very high quality lens but it is also three times more expensive than the Tokina which makes the Tokina one heck of a bargain for the Tokina is a very high quality lens also and an extremely good macro lens. The fact that it has an aperture collar will also make it very useful with many bellows and extension tubes. I really recommend this lens if you are into serious macro photography. I have the Tokina 100. Hello, I can get my Tokina 100 2.8 macro to shot at 2.8. Is there a problem with my lens? I just bought if from Amazon. I am using it in a Nikon D7000. Thank you for any help you can offer. Bought this model after looking at reviews. I am very pleased with the quality of the pictures. I only use it in manual mode as the autofocus is slightly off. It has now developed a fault; between 31cm and 40cm the diaphragm doesn’t close. The Canon body reports : “communication error 01, clean the contacts”. This can be checked by pressing the depth of field preview button which should close the diaphragm. This means that between those distances I can only shoot at f2.8. Has anybody seen this before? I expect it will be costly to repair…. The aperture flex cable needs a replacement. It costs a very small amount of money. I bought same lens and have same “communication error”. Have you fixed your lens? the most interesting man in world- he can a ride six white horses simultaneously While Straddling a fence. The lens is very clear st clase distance but I can’t make sharp Photos in infinity focus.